Marco Island and Naples is home to a myriad of wildlife. Around 150 species of birds and many threatened and endangered animals, thrive in the estuarine environment and surrounding upland hammocks and scrub found within the Rookery Bay Reserve. The area we kayak will inspire, relax and leave you with memories that will last a life time. Let our naturalist kayak tour guides entertain you and educate you as we take you through Marco Island's mangrove tunnels today! Book online and use promo code "marcoisland" to get 5% off! This is the tour you've been hearing about! As we kayak, we'll look for bottlenose dolphins, jumping mullet fish, mangrove tree crabs, soaring birds of prey, conch shells and more. The kayak tour lasts 2.5 hours and we'll paddle around 3 miles. During the kayak tour, your kayak tour guides will be teaching you about the mangroves, the history of Marco Island and every bit of wildlife we see. If the tour is during low tide, we'll be stopping on a sand bar to look for critters. If the tour is during high tide, we'll spend more time in the mangrove tunnels. Our kayak tour guides will also be taking high resolution photographs of you and your party and you'll receive those photos the same day, FREE! Everyone gets their own 1-seater kayak with a high-back seat, cup holder and adjustable foot rests. We also have 2-seater kayaks if you have children under 12 attending or enjoy arguing with your spouse. Waterproof bags are also provided for your important belongings. 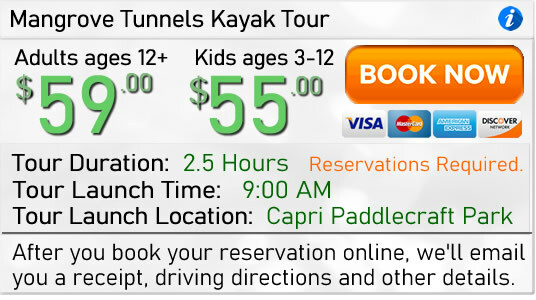 Kayak tours launch from Capri Paddlecraft Park and Reservations are Required. We sell out quickly, so it's recommended to book as early as possible. Book online today! After you book your kayak tour online, we'll email you with driving directions and all the details. Waters around Marco Island can come alive and glow! Fish, paddles, kayaks, even your hand moving through the water produces a splash of tiny fireworks that manifests as a bluegreen glow. Bioluminescence! Why does the water glow? In varying concentrations, the water hosts single-celled organisms called dinoflagellates. While there are over 4500 species of dinoflagellates identified, some species, when disturbed, will emit light. This is called bioluminescence. With concentrations great enough, the water appears to glow. It is bright enough sometimes to cast shadows! Typically, warmer water hosts greater concentrations and, hence, a brighter glow. The experience is awesome. A true "Must Do" while on Marco Island. Many critters will emit bioluminescence. Another commonly seen critter on these tours are the "comb jellies". Disturb the jelly and it will flash! Varying concentrations of comb jellies occur, as well. Many times we will see both the flash of the combs and the glow of the "dinos". As the water cools, the combs tend to dominate the viewing. Bioluminescence is best viewed during the darker phases of the moon. The darker the night and closer to the new moon, the better viewing conditions will be. As with any outdoor activity in the natural world, sometimes the viewing is great, sometimes not. Even though the conditions are "right", sometimes the bioluminescence can be weak simply because of the concentration of the organisms. You can always contact us and we can try to let you know. However, most times, "we don't know unless we go". So come on! We offer evening moonlight and full moon trips throughout the month. However, we will not schedule bioluminescent tours when the moon is too bright to see bioluminescence. There are only a few totally dark nights monthly, but, there are other "acceptable level" moonlight evenings. We will still offer moonlight tours on those bright moon nights. An overcast night may result in seeing good bio even during days the moon is bright. In season, bioluminescence is usually visible in the shadows.